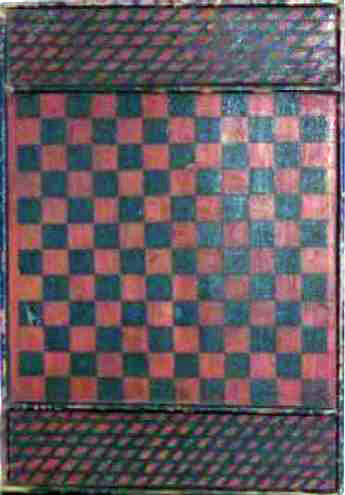 Presented here, a Red and Black Checkers Gameboard with "Diamond" Keepers. Excellent original surface with the paint mostly intact. There is "honest" wear to the paint, mostly on the molding that surrounds the board and on the dividers that form the keepers. The color is good, the surface is dry and slightly alligatored, with even in-use wear. Square nail construction. It appears that the maker intended to make another game on the reverse but never got around to it. Circa, mid 1800's. Size is 18" x 30".